How many people make a crowd in crowdsourcing? For a crowdsourcing initiative to succeed, one of the fundamental requirements to be fulfilled is to gather around the initiative a crowd large enough. And here is where the big question raises: how many people constitute a large enough crowd? Obviously, there is no exact number of individuals for any situations, but the question is more complicated. Most authors describe the crowd in different ways: the Internet public, a large group of people, users, customers, consumers, etc.. In short, they refer to the crowd as a lindeterminate and large group of people, which does not know each other and do not interact (with the exception of the online user communities). Other authors, like J. Surowiecki, author of famous book “The Wisdom of Crowds”, claim that a crowd refers to a group of people who can act collectively to make decisions and solve problems. Therefore, a large organization can act as a crowd, but also a smaller group, as a team of scientists. The only person who has given a round number, mentioned by Jeffrey Howe in his book “Crowdsourcing: how the power of the crowd is driving the future of business”, is Alpheus Bingham, founder of the R&D crowdsourcing company InnoCentive. Bingham says that the optimum size of a crowd is 5000 individuals. Actually, he refers to the fact that, given a problem, it is difficult for a crowd of at least 5000 heterogeneus individuals to not find a solution. Given these three perspectives, I personally believe that the optimal number of people to form a crowd in crowdsourcing will depend on the objective of the initiative and the task at hand. Because it doesn’t need the same number of people the ChangeByUs initiative, the evolution of the GiveAMinute project in which the city of New York invited their citizens to suggest ideas for improving the city, that the Carlos Jean’s Plan B, in which songs are created from audio tracks sent by crowdworkers. An initiative where the crowd is too large, from the point of view crowdsourcer, will imply the disadvantage of the cost (in time and work) of analyzing and assessing each and every one of the contributions received. Just imagine that a company uses AMT to get the translation of a one page chinese document… and receives 2000 translations. 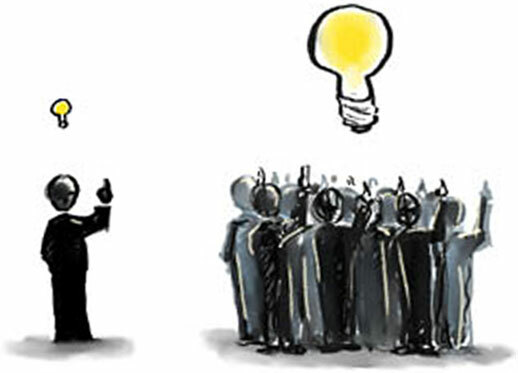 From the crowdworker point of view, if the crowd is too large in all-for-one initiatives, where there is only one crowdworker who will be rewarded (such are the challenges on InnoCentive or the design tasks 99designs), implies a greater likelihood that his or her work is not chosen. In the case of a very small crowd, the results can be not representative. Although 10 people translating 3 paragraphs may be an acceptable number (even excessive), 10 people participating in an initiative like ChangeByUs is a number clearly insufficient.